So it’s still August, but my kids just wrapped up their third week of school. We’re kind of back in the swing of things, it’s sometimes a tiny bit chilly in the morning, and the fall candles are at Bath & Body Works (you know, the barometer of seasonal change). So even though we’re still hitting the high 90s just about every day, I’m itching for some fall baking. To make the scones, you’re going to need flour, baking powder, baking soda, salt, pumpkin pie spice, cold butter, and buttermilk (full-fat if you can find it). Preheat oven to 400 F. Place the baking rack in the middle-low position. Line a baking sheet with parchment or a Silpat liner and set aside. 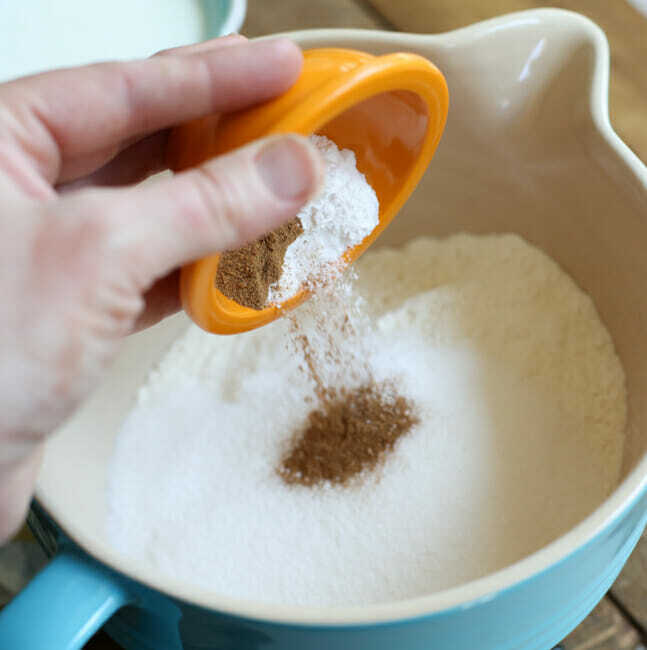 To make the scones, whisk together the flour, sugar, baking soda, baking powder, salt, and pumpkin pie spice. Grate the butter and toss it in the flour mixture, combining it with your fingers until it resembles coarse meal. Set aside. In a small bowl, whisk together the buttermilk and egg. 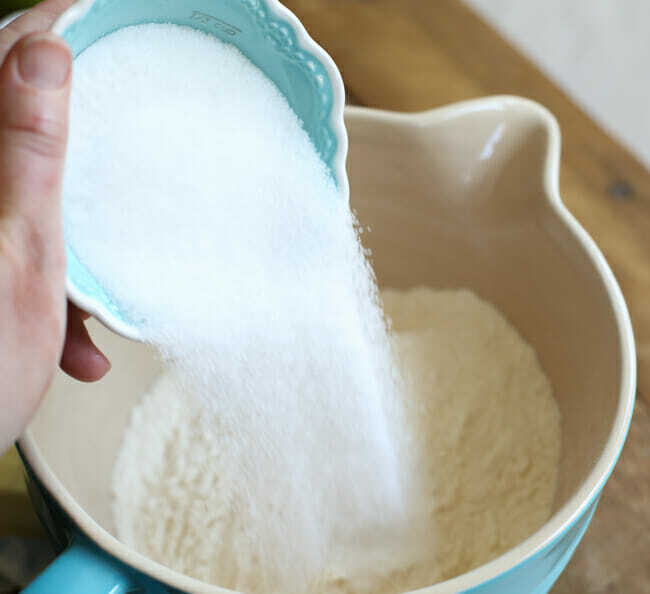 Drizzle it over the flour mixture and then toss it all together with a fork until everything appears moistened. Gently press the dough into a ball–it will take some time and some parts of the dough will be moister than others, but continue pressing until it forms a ball. Lightly flour a surface (you can use the line baking sheet if you want) and place the dough on top of the floured surface. Press into an 8″ disc and set aside. 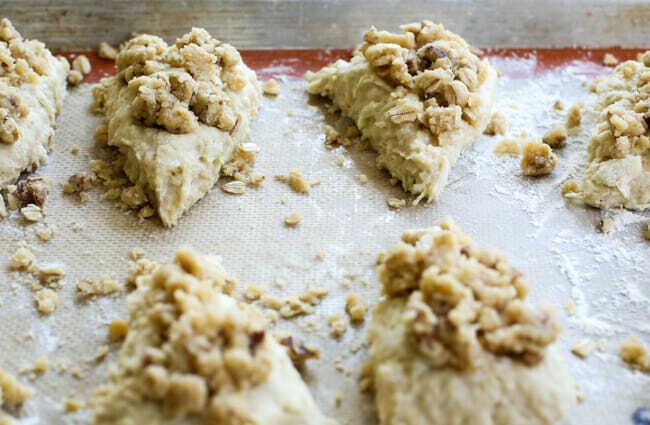 To make the streusel topping, combine the flour, pumpkin pie spice, brown sugar, oats, salt, and pecans. and mix until fully combined. Sprinkle it evenly over the scone disc. Cut the disc into 8 equal wedges. Separate the wedges and place them evenly on the baking sheet. Bake in the preheated oven for 15-17 minutes or until the bottom edges are lightly golden. Remove the pan from the oven and allow to cool. While the scones are cooling, whisk together the glaze ingredients. Place in a Ziploc bag. 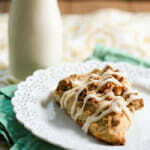 When the scones are cool, snip the corner off the bag and drizzle over the scones and serve. Itching for some fall baking? 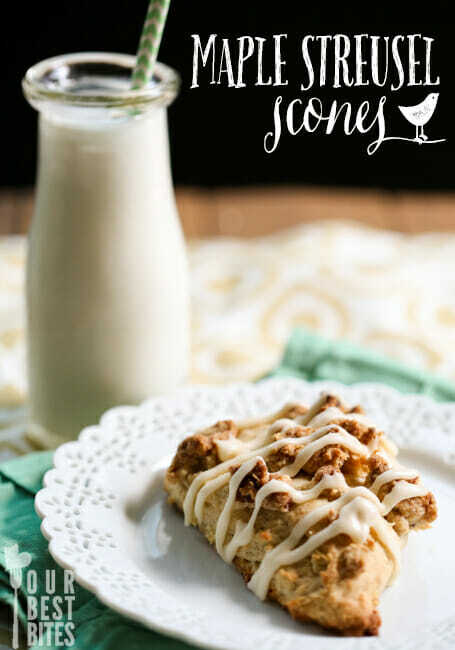 You are going to love these Maple Streusel Scones! 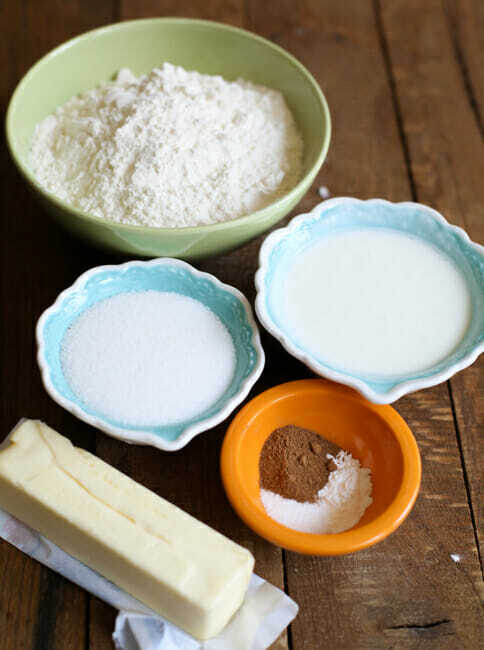 To make the scones, whisk together the flour, sugar, baking soda, baking powder, salt, and pumpkin pie spice. 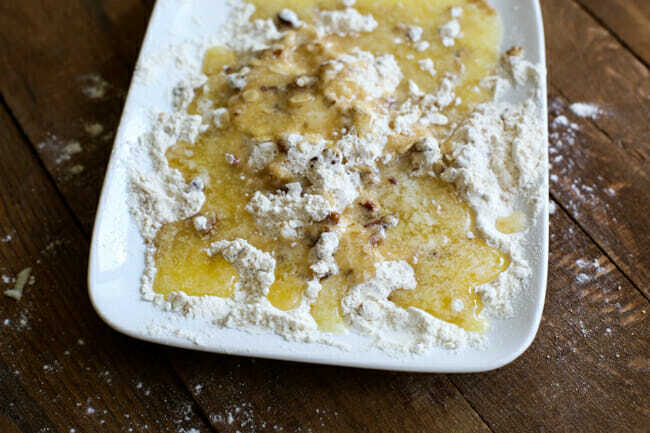 Grate the butter and toss it in the flour mixture, combining it with your fingers until it resembles coarse meal. Set aside. 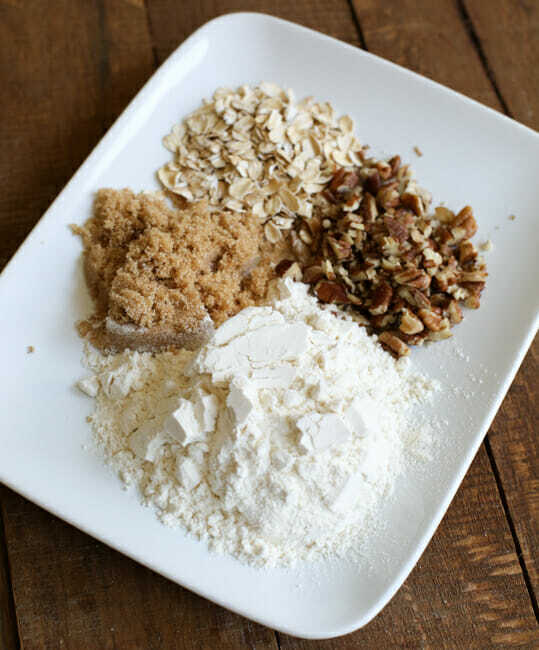 To make the streusel topping, combine the flour, pumpkin pie spice, brown sugar, oats, salt, and pecans. Add the melted butter and mix until fully combined. Sprinkle it evenly over the scone disc. Cut the disc into 8 equal wedges. Separate the wedges and place them evenly on the baking sheet. Bake in the preheated oven for 15-17 minutes or until the bottom edges are lightly golden. Remove the pan from the oven and allow to cool. Mmm so yummy! I love the streusel! We live on Summer weather all year long, but this definitely makes me want to do some Fall baking! This looks yummy Kate. Looks very tempting! Have the price of pecans gone sky high where you are? It makes me sad. I know I could use walnuts, etc. but I love pecans. Do any of your readers know where to buy pecans at a decent price? Thanks! Or go totally in the opposite direction and buy the giant bag at Costco! Lol That’s what I do, and ounce for ounce it’s a lot cheaper than the grocery store. They keep in the freezer for a long time. yup. but they don’t last that long around here! oatmeal, salads, cookies, general snacking. yum! Looks delicious! I love the fall and its flavors, other than the fact that it precedes the long winter. Winter where I live kind of seems like most of the year–no spring to speak of, then summer arrives mid-June and pretty much leaves by the end of August. I love streusel with nuts! If only my husband liked nuts, then I could justify the expense. Oh my gosh, these look so good! I can’t wait to try them! I made these yesterday and they turned out fantastic!! I made two batches, one regular and one gluten free. Both batches of dough, however, were extremely sticky and never formed a “ball” as stated in the directions. I just had to kind of pat the dough down onto my pan to make it into a circle and then it was also pretty tricky trying to separate the 8 wedges after I cut them. I double checked all my measurements and made sure I didn’t miss any ingredients. Are they supposed to be that sticky? cannot wait to make these! yum. currently baking an apple pie, which has a cinnamon roll crust and a similar streusel on top with a cream cheese icing drizzle. smells incredible. We are buying our very first home and would love those in my kitchen!!! Hey, Nancy! I got the cups from Pier 1 and you can get the measuring bowl here: http://www.zappos.com/le-creuset-2-qt-batter-bowl-caribbean?ef_id=UtNqnwAABNkn5mq4:20140902030547:s. Congrats on your first house! So I totally made these this weekend and they were yummy. Then I realized I left out the sugar. Ha ha ha. Oops! But there was enough sweetness from the streusel and glaze. Thanks for the fall recipe! I could be missing something, but the recipe never indicates when to mix in the 1/3c of sugar for the scones. Do I add it with the flour mixture?